Don't buy any old good luck charm: Captured Wishes has the best one available! 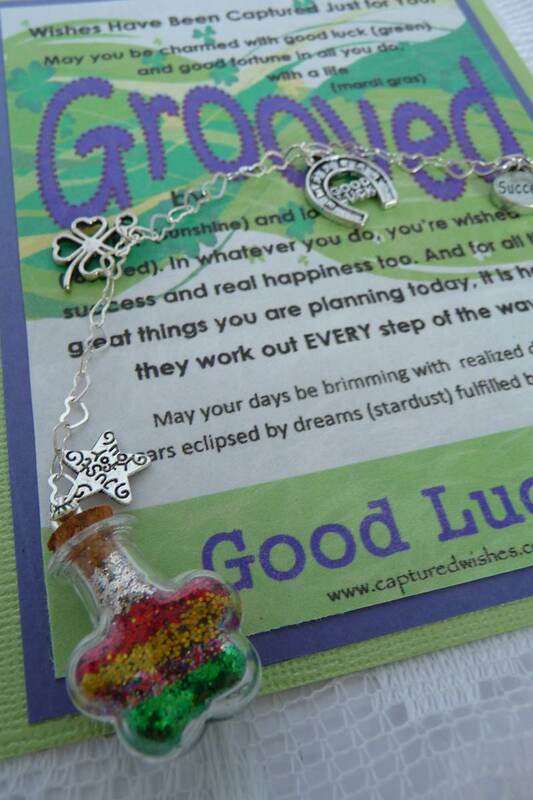 This Good Luck Wishes vessel is layered with lucky Fairy Dust and is the complete, original and beautiful gift idea for anybody you're wishing well. Get your good luck groove on. Get in the groove. Help get someone's path grooved with wishes for success in the plans of tomorrow. Is a special person in your life starting on a new venture? Taking a new direction in their lives? Or just in need of a luck boost? This Good Luck gift idea is perfect. It summarizes your thoughts in those moments when you truly long for the best for somebody close to you. This shamrock-shaped Fairy Dust Wish vessel is sure to bring smiles to the face of your recipient and send them on to their future with a spring in their step! The Wish vessel measures 22mm high x 22mm wide. The colored Fairy Dust is identified on the included color key and verse card. We've also included a suction cup, so your loved one can hang their Wish vessel in a place it will inspire them every day.